Many wish to understand how all of this works not only spiritually, but scientifically too. for all of you who desire that wisdom, here is the description of the other planes of existence. Within the picture to the left, are the levels of existence. I will start from the bottom up excluding our own plane since we already know what that is like from living here. 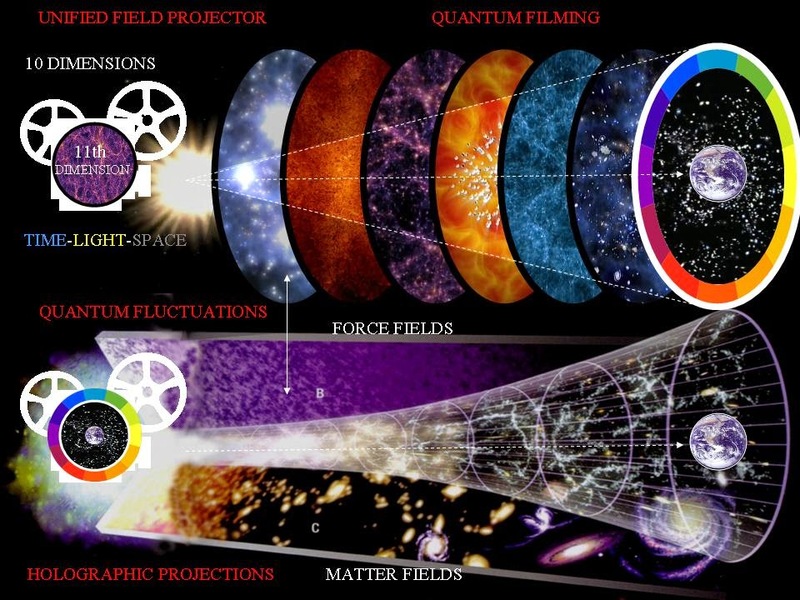 The say it is within the Universe, but I am saying no.. Having been within the matrix, I know that these are actually the spiritual planes of Earth’s dimensions.. in another article, I showed you the layers of the Earth’s projection. The Veil is the thinnest layer between this world and the next. it contains thoughts, feelings, and parasitic entities, that swim there, so to speak. I actually mean float, but swim is a better term. It is a screen, and things get caught and attached to the screen, lookers from the inside out, and then people like me, who are lookers who are observing in,out and beyond.. I am not just a psychic though, but for regular psychics, they look only into the veil. Those who channel or view are either gaining access here, or to the astral world.. many lost souls end up here too. They can not leave their old loves, nor are they ready for death. This is why many should not be cremated or buried until after three days of death. There is always an essence left in the body after the first death. It takes up to three days for the rest to come out, that little etheric cord still hanging onto the body. If buried too soon, they will stick to the veil. psychic vampires are also in there… Guides will only come to the veil to advise their assigned person. The level above us, after the veil, is where the first one spirit goes through after death once the full death is complete, It inhabits many spirits that live there, the Astral Plane. You will go through the veil between worlds first, before arriving here which can also be considered as a sub plane. The astral plane has a higher vibration than us but still lower than the others. Sad to say, but we are truly in hell. Violence, crime, all sorts of immorality. The plane humans live on, is a horrible place, and on of the lowest realms to be. It has a confusing landscape since the beings there create the surroundings by their thoughts and emotions. Anything they think and feel, will exist here, so you can only imagine what it would look like due to what many thoughts and emotions consist of. Fear, love, depression, happiness, as well as the imagination which is is a part of the subconscious. This realm can have the souls of anyone, who got lost on their way to the higher realms considered to be heaven. Some here, are exiled here for their violations, and those who are negative, and otherwise of a lower vibration, will exist here. Beings from the upper realms can visit, just like they can visit ours, but their stay is never very long due to the difference in their own vibration, and the vibration of the astral realm. They have too high of a frequency to stay long. 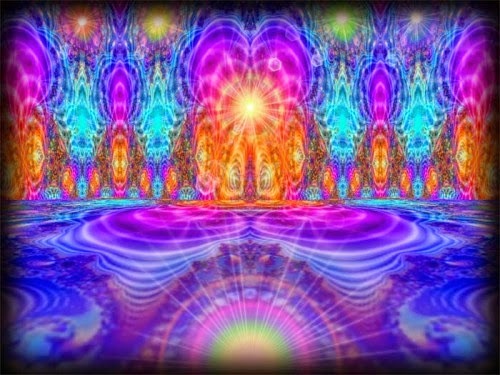 Many are connected by the aura layers, overlapping in the realms. Many who astral project, enter here. But in astral travel, one is not actually in the entire astral realm. They are only in “their” domain, within astral. Astral travelers project into their own astral layer of consciousness. It takes the activation of the Merkaba, and OBE, to actually travel beyond. For the astral realm as a whole, it is very much like a dream world, being a good dream to some, whilst being a land of nightmares to others. There quite a few sub planes to this realm with all different types of beings. 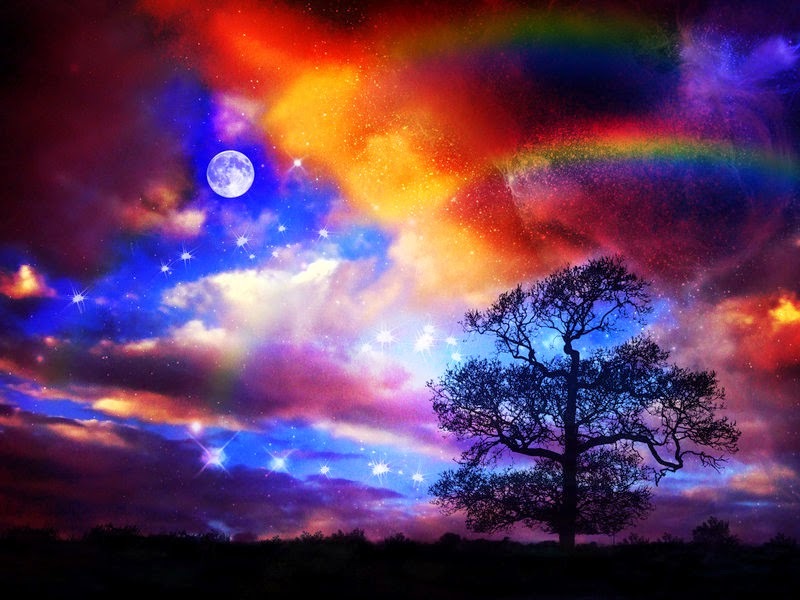 The upper astral realm can also consist of light beings from other star systems, as they come from all dimensions depending on their vibrations. Fairies and mystical creatures are here too. Lower astral realm (aka Purgatory) is where demons dwell, along with the people and other beings that have joined them. The thoughts of everyone float in this realm until you actually get there and manifest it into your own environment. Most of the time, they will still have attachment to the 3rd dimension here on Earth, and continue living as if they were still alive. For example: My grandfather being a paranormal investigator, and a demonologist as well, he dwells in the lower astral. My Grandmom and Uncle are in the upper astral realm, living in their own self made environment. They live as if they are still on Earth, having a little apartment together and actually making it seems like they are going about life in New Jersey still. They go food shopping, celebrating holidays, and all. They chose this for themselves. This is the astral realm. In it are many gateways and portals. The secret government also has spies here, people, psychics, that they astral projecting into the homes of unknowing people. They have wireless energy waves here that is use for controlling things behind the scenes, psychic assassins, and psychic investigators. 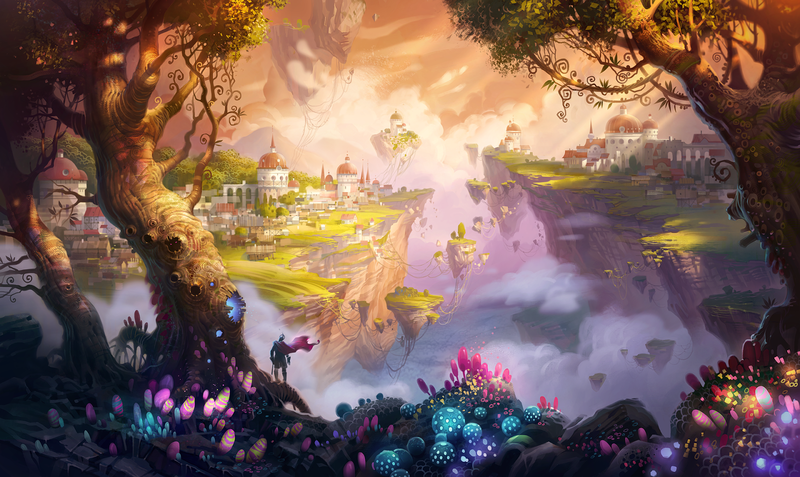 One place in the 5th dimension, is also referred to as the “Summerlands” by some faiths. Often this is confused with being in heaven, when in fact it is only one of them. This is the paradise like place, that people describe as the place that good people go when they die. This place holds many types of beings in it such as light beings, fairies, human souls, and mystical creatures too, if they have a higher vibration. Some ascended masters exist here too. They also call this the Garden of Nim. The greater spirits of the elements also reside here, especially the spirits of air. When you get to the other places in this world, you will find another type of domain. It houses those who rebelled against the creator, called Fallen angels. The star beings who joined them, also exist there. Together, they are called the Archons. The Archons have made it almost impossible for anyone to pass by here now. Also, they made it so that absorbing all of the negativity from the lower realms, that a layer was placed here, so that no one could reach the angels above, nor the higher selves of many souls who have an avatar on earth’s 3rd dimensional planes. The Archons have spiritual minions that expand down to the 3rd dimension too. They have a hierarchy of their own. Scary. The 6th Dimension is another heavenly realm full of celestial bodies and those who help keep the Universe in order. 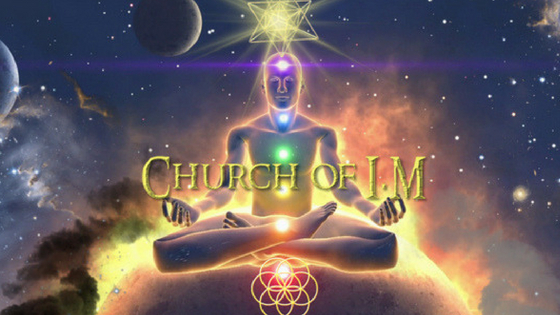 There are Cherubs who act as escorts of souls between realms, the angels who make up the principalities reside here, as well as light beings, spirits of beings in different planets, ascended masters can be here too, if all selected to help govern. 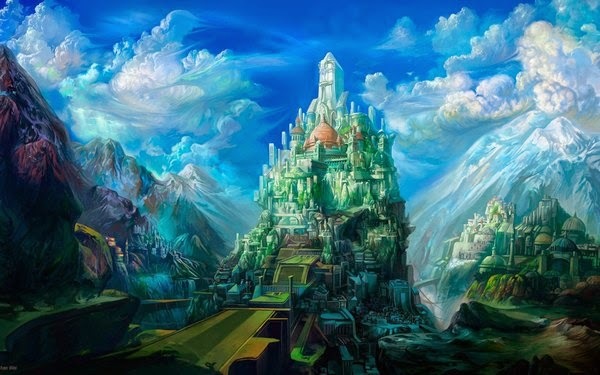 It is a beautiful celestial home much like a kingdom made out of precious gemstones, as most of the upper realms are. It is exquisite and like the capital of the heavens. The beings here are also called Virtues. They hold the laws, or virtues of the planes within earth. Please see Angelic Hierarchy page on my site, to learn more. They have alot of the same set up for the demonic realm, but a few differences. One day I will get into that, but fornow, they are not worth our time acknowledging. For now, this realm contains the cherubim, virtues.. The 7th Dimension is the highest level of the Angelic realms of Earth, and the last plane here. They should be the true archons, but the others stole it away, got a realm closer to humans to rule over them, and then blocked everyone.. Although angels can exist in any of the realms when directed to do so, and the counsel resides in the 6th, a majority of the heavenly host will either be here or the in the 8th realm. The 8th realm is not in this Earth or it’s planes. This dimension can also consist of high ascended masters, the beings that have a high vibration that dwell on other planets through the Universe, and the angels who make up the Principalities. This realm is full of pure color rays. There isn’t much of a landscape here as the beings here are more intelligent, and have an advanced consciousness which they simply just exist within. Therefore it is just a realm of light. Those here, can manifest forms for themselves when they go to other dimensions, but here they are merely huge orbs of light. Sources of intelligence of the highest kind, and purity. They are creators, and also rule as deities. To them, they see one another as we do here, but to humans they would be only light. They see all that wish to see, and they do see all. These angels are called thrones and some are also holding a title of power too, because they have to be in charge of the legions who oversee the thrones.. This dimension is, where all of the light energy and consciousness come together from God in order to branch out, and form the other realms below it, and the beings within. 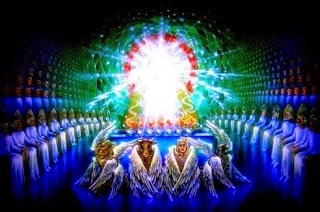 This is Angelic Realm, where a lot of the angels who make up the High Spiritual Light Counsel reside. They exist in particles of light energy, made of only consciousness. They need no form what so ever, as they are omnipotent. and omnipresent. They make up what is called “Elohim”. Many spirits making up one spirit body. It is made of static particles of powerful energy that have high levels of consciousness. This is much like hyperspace. These are the principalities and dominions. When passing through these realms to get to the throne of God, you go up a beautiful stairway of light. 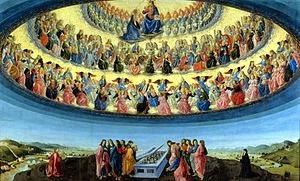 It has been recorded that angels descend and ascend this stair way to get to and from, the different dimensions/heavens. At the top of the stairway, there is a gate that one must go through to get to the throne of God. 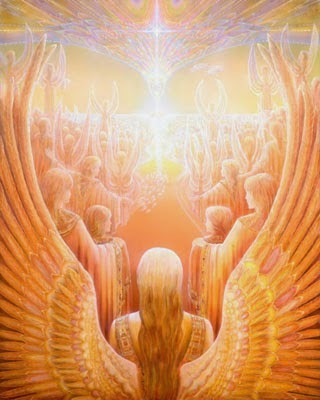 On the highest level of this dimension, exist the Archangels. in some religions, they have archangels listed as last in the hierarchy. But no.. That is not true. Just a way for the archons to knock those in supreme power. Any mankind believed it. The world Arch means “commander and chief”. You have to be huge in power, at the top, to be a commander. The 9th Dimension is home of the Crystal Cathedral Temple, where God’s throne is. He sends his consciousness down on it in the form of brilliant white light in order to preside over the realms, counsel meetings and those who come to plead their cases or clear karmic debts. This temple is made of beautiful crystal infused with white light and inside the temple where God’s throne is, are the 4 living beings who acts as a body guard to it,and the Archangels who are considered to be the Princes and Princesses of the Heavens! The photo to the left, is a great depiction of the throne room except you can not see the sea of crystal, that gives those there, a view to the Universe, or the many coliseums of angels and light beings, not to mention the stars and galaxies above it. It is a beautiful sight, somewhat frightening to those who are not used to the appearances of the spirits there. In another part of the Cathedral is the Light Library containing the Universal Akashic Records where you can look into your past lives, and existences through out the Universe. If you want to have your Akashic Records read for you and discover your past lives contact me on my site. Past Life Reading. I can also clear your karmic debts that may be holding you down in life.Karmic Clearing. However, continuing on, the lesser deities reside here too. The others who rule over all of the others, live here, in their own worlds in the many gateways or portals existing in it. A whole other level. The library holds all of the Universes information. I have tapped into it. I saw the cathedral. Alot of the beings who exist in some position of power in any of the realms, act as a deity of sorts to that realm, some to the entire plane, and some to the entire dimension. Many have messengers who come from those planes into another, to teach something or act out a task. Some. make changes in them in a big way, such as the ascended masters, or messengers who came into the 3D, and changed culture, civilization,or humanity in some huge way..You can also watch my goofy explanation of all of this in my YouTube Video. However, the realms and dimensions, are a topic we could discuss forever.. For now, I hope this gave you a good idea of the earth’s. In this, since the Universal akasha exists in the upper plane, there is also an akasha for each plane too. Earth has them in each plane, and then there is an akasha for the entirety too. Every form of consciousness has it’s own. Albert Einstein was tapping into the Earth’s akasha. That is how he became so intelligent. It is an amazing thing to read for any one of them, yet alone having access to them all. Akasha Readings, located on “Past Life” page. As an Incarnate Angel having unlimited psychic abilities, I get frequent visits from beings who come from all of those different dimensions , realms, and planes.. I love meeting all of the different types of spiritual beings. Being able to go outside of this world and go to them, makes it possible to meet them all. So, there you have it. The many planes that make up our Heaven. Many things to learn. If you wish to grow even more and go deeper, please ask about my Truth of Living Light, course.